State justices on July 11 upheld, with some conditions, a parenting agreement in Rosecky v. Schissel, No. 2011AP2166. 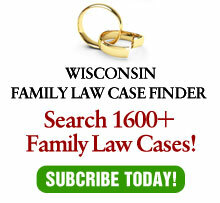 The case involves a surrogacy agreement, the first case in Wisconsin of its type to be decided. Monica and Cory Schissel and Marcia and David Rosecky entered into a “Parentage Agreement,” where Monica would become pregnant and carry a child for the Roseckys. The agreement provided the Roseckys would be the legal parents of the child and would have legal custody and physical placement, and that the parties would cooperate fully in any parentage proceedings to effectuate this agreement, including a TPR and adoption. Monica became pregnant through artificial insemination using her egg and David’s sperm and subsequently gave birth. Shortly before the child’s birth, Monica informed the Roseckys she no longer wanted to give up her parental rights. She allowed the baby to go home with the Roseckys after the birth. Columbia County Circuit Court Judge Alan White found the agreement unenforceable, concluding that he couldn’t force or require Monica to participate in a voluntary TPR. He awarded sole custody and primary placement to David with secondary placement to Monica. When David appealed, the court of appeals certified the case to the Wisconsin Supreme Court. Justice Annette Ziegler’s opinion held that while the portions of the agreement requiring a voluntary TPR didn’t comply with the procedural safeguards set forth in Chapter 48 of the Wisconsin Statutes, they could be severed from the remainder of the contract without defeating the primary purpose of the agreement. Therefore, the high court concluded that aside from the TPR provisions in the agreement at issue, the agreement is a valid, enforceable contract unless enforcement is contrary to the best interests of the child. The court also rejected Monica’s argument that the agreement is void as against public policy. Instead, the court held that parties can reach private agreements on custody and placement, subject to review by the court as to whether the specific agreement comports with the best interests of the child. Since White’s custody and placement orders were made without considering the agreement, the justices remanded for the lower court to revisit those orders in light of the agreement. There are two things I like about this decision. First, the court has recognized the value of parties reaching enforceable agreements. In a free society, people should be able to negotiate enforceable agreements as long as there is no fraud, coercion or public interest involved. Second, the court has recognized the harm to children inherent in parents fighting through litigation. Unfortunately, the court doesn’t recognize either of these positives in other areas of family law. The Supreme Court has held that parties are not allowed to contract for child support that would avoid litigation. Worse, the court of appeals has held that parties aren’t allowed to agree to a contingent placement order, where a future event is contemplated. Apparently, the goal to reduce “contentious litigation” doesn’t exist in all circumstances. The decision, in my opinion, is the right one, but leaves a large gap. Since the child’s best interests would trump the agreement — as they must — what happens now that the child has been told Marcia is his or her mother, apparently since birth, more than three years ago? Presumably, by the time this matter gets back to trial before the circuit court, the child will have established a relationship with Monica. Since stability and maintaining relationships are important to a child, the trial court will have to consider whether, due to its own erroneous order, the best interests of the child trump the agreement. If so, this was a purely Pyrrhic victory for the Roseckys.